The Bealach na Ba (Pass of the Cattle) is the UK’s highest mountain pass and the main gateway to the Applecross Peninsula. The dramatic, twisting single track road to Applecross over the Bealach na Ba climbs to a height of 626 metres (2,054 feet). Traditionally the road was lined by drystane walls to act as a safety barrier and to hold back the hillside into which the road was carved. Unfortunately many of the walls had been removed or damaged by road widening, installation of metal barriers and by traffic. A range of features which control the water flow from the hillside, including culverts and lined water-courses are also still in use today although many now require repair. This project allowed for the repair and consolidation of stretches of these dykes. 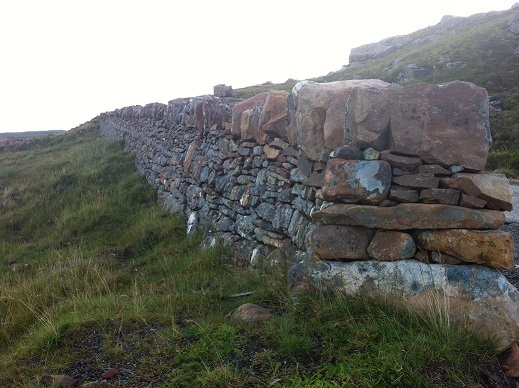 The work was done by experienced drystone waller, Geoff Walker and Darren Jones. Darren trained in drystone walling through the ALPS programme and went on to all of the drystone wall projects within the ALPS scheme.